This is the second of what may become a regular series of articles about events gone by based on the theme of a century ago (and 50 years and 150 years). November 1863 seems to have been a quiet month for the Metropolitan Railway so we turn to November 1913 where quite a lot was going on. On 17 November 1913, West Harrow station was opened. Lying between Harrow on the Hill and Rayners Lane, the station was needed in order to serve an area in which house-building was in progress but which was about three-quarters of a mile from Harrow-on-the-Hill. Pressure for the station had been exerted by landowners and residents of the New Bessborough Estate (south of the line). Development had started as long previously as 1906 but the railway had been slow to oblige. The new station was built almost entirely of wood, very much in the ‘halt’ style the Met favoured for these emerging communities. The 350ft long platforms (most of which were 10ft wide) each had a small wooden shelter half way along. Each platform was accessed from Vaughan Road by steps and individual access passages that were located either side of the bridge. The passage on the ‘up’ side was provided with a small booking hut adjacent to the roadway. The ‘up’ side shelter was increased in size around 1916, after traffic had picked up, and even included lavatories. The creosoted wooden structure presented a particularly grim view high up amongst the bright new houses and after some pressure had been exerted the outlook was softened by provision of shrubs and trees along the embankment. The platforms were lengthened in 1929 in order to take 8-cars and at the same time the stairs to the road were roofed over, the ‘up’ side shelter extended, and the covered area of both platforms enlarged by extending the canopies. Despite these improvements, the station essentially survived in pretty much original form until rebuilding began in October 1989. The present, modest, structure has retained ticket-selling facilities on the ‘up’ side only and still requires passengers for the Uxbridge direction to return to the street before using the separate passage to the other platform, an unusual arrangement these days that may even be a unique survivor (Hounslow East had been another until quite recent years but I cannot think of another Underground station today where one must resort to the street to change platforms). 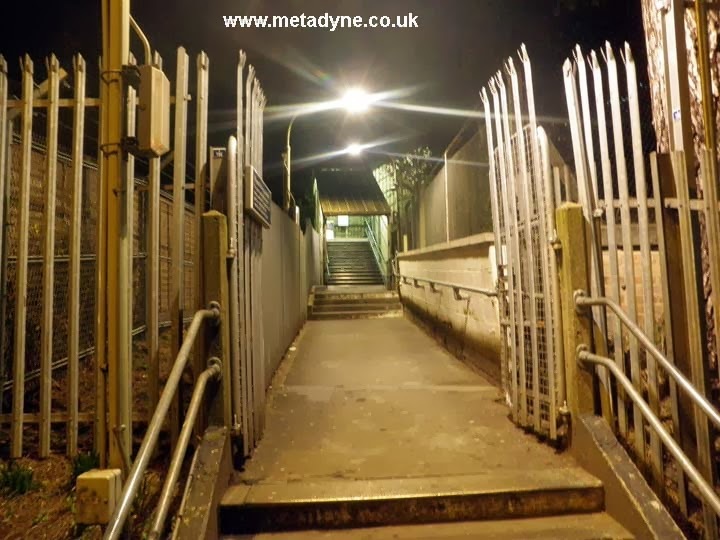 Such good design features as the rebuilt station may have are somewhat marred by the overpowering impact of the metal railings that flank the access passages, a feature that is particularly sinister at night, reminding one perhaps more of a prison camp than a railway station. I think this is a good example of a location where a lot of well meaning people, each with their own standards, objectives and targets, come together to present the world with the ‘wrong answer’. West Harrow was never a particularly busy station, and it was only from 1974 that all passing Metropolitan Line trains called there. West Harrow (WB). Can’t fault the level of lighting, but this is about as unattractive an entrance as one can find. On 30 November 1913 the Metropolitan Railway opened its ‘widened lines’ between Finchley Road and Kilburn. It was short of Kilburn, actually, as the additional tracks terminated at a junction with the old ones just east of the bridge carrying the Metropolitan over what today we call the North London Line. This was the first section of a widening project that extended from Finchley Road to Wembley Park, the other portions requiring far more extensive engineering work. The railway had originally opened from Swiss Cottage to West Hampstead on 30 June 1879, extending to Willesden Green 24 November 1879 and through to Harrow on 2 August 1880 and was just two tracks throughout. This section of line was electrified in 1905 and stimulated the process of housing development to which the Metropolitan responded by further improving train services to its outer areas and developing a complex pattern of stopping and non stopping services. It was not long before the constraints of a twin-track railway became all too evident, so the railway decided to build additional lines to carry the fast trains as far as Wembley Park, by which point the services had thinned down. The widening required complex phasing of work and the conversion of the platforms at Finchley Road from side platforms to an island (this is the one that today serves northbound trains). The new fast lines then bypassed the station on the north side and converged with the old line in tunnel south of the station, a difficult job underneath the road that was achieved with little interruption to the train service. 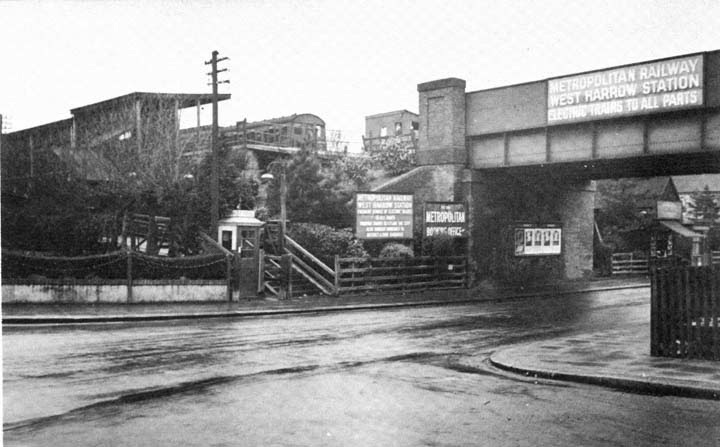 This view looking ‘north’ into Finchley Road station in 1913 shows the old lines slewed to the left, with the old ‘down’ platform converted into an island. The old ‘up’ platform on the right awaits demolition before the new pair of ‘fast’ lines are installed. It was in November 1913 that the automatic signalling was finally completed on the Central London Railway when new Westinghouse electro-pneumatic signalling was installed at Shepherds Bush, replacing the manually-operated signals there. It is hard, today, to imagine a deep tube line controlled by men in signal boxes at every station, pulling large mechanical levers that operated wooden signal arms mounted at station headwalls, but that is how it was (intermediate signals were also mechanical, but had just the coloured spectacle plates as there was no room for signal arms). The mechanical signalling was provided by the firm of Evans O’Donnell, but was enhanced by so-called ‘lock and block’ control designed by a man called Spagnolletti, previously the Great Western Railway’s telegraph engineer. By this means rigid adherence to the block telegraph regulations was enforced by the fitting of electric locks on the levers controlling the starting signals. By this means the signal allowing a train into a section could not be lowered until the signalbox in advance had accepted the train, and additionally the train ahead had to be proved to have departed by having operated an electric ‘treadle’ plate situated on the track and against which a copper brush located on the rear car of every train had made contact. It was unfortunate that shortly before the equipment in Shepherds Bush box was replaced there was a serious accident. Provision had to be made for releasing the electrical locking in case of failure, and at Shepherds Bush it was released irregularly. An experienced signalman made an initial mistake in putting a signal back before an approaching train had actuated the treadle, and had to release the locking using a sealed plunger. He then got into a muddle and made a succession of further mistakes that allowed the following train to approach before the first train had left the station, allowing a low speed collision to occur. The inspecting officer noted that automatic signalling was about to be introduced and remarked that lock and block was evidently not foolproof (though it remained in use on several busy sections of the Underground for a decade or so longer). It was in November 1963 that a rail-heating trolley was introduced for use on open air sections of the Underground to facilitate certain work on the track. As we all know, rails tend to expand and contract as air temperatures vary. Normally, undisturbed long lengths of rail do not need very much attention but difficulties arise when a line of rails is broken during engineering work (for example to replace a section of rail). The get the stresses correct a quantity of keys were removed until the stresses were correct, but this work could only be completed satisfactorily during certain times of the day in spring or autumn as temperatures affected the dimensions of the rail and the stresses within it. Needless to say, this was very restrictive and required severe speed limits being imposed on trains as the work took place while the service was running. The ideal was to do the work at night, when trains were not running, but the rails were then too cold. The answer was to warm up the rails to get the conditions correct. 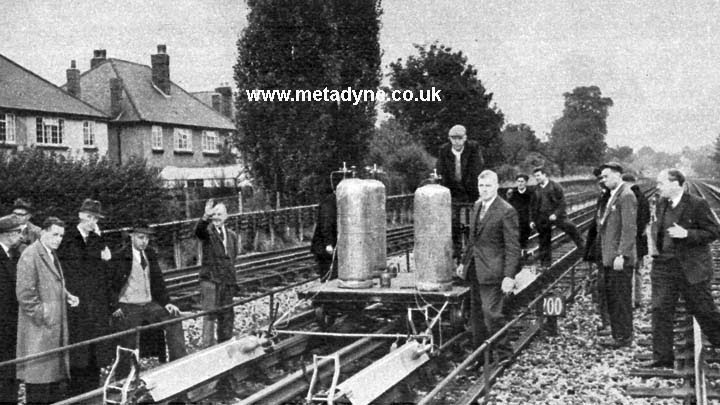 Experiments during 1963 proved this to be a viable process and in November a trolley was introduced upon which was fitted a gas cylinder and burners that were located just above the running rails. The trolley was pedal-propelled and could be driven along the section concerned until the rail was approximately at the desired temperature, between 75 and 80 degrees Fahrenheit. When all was ready, the necessary adjustments were made at the rail expansion switches and the keys all replaced. The initial experiments took place at South Ealing, but the process was also tested on a section of flat bottom rail (then not very common on the Underground). Rail heating trolley near South Ealing, burners in front of it. It was on 25 November 1963 when High Street Kensington goods yard was closed (officially the first day of closure, a Monday, though no trains were scheduled over weekends – the date of last train I do not know). This had originally been opened by the Midland Railway in 1878 and was just west of the station; it was connected to the District Railway via a steep incline that connected with platform 4. It was primarily a coal yard and trains from the Midlands travelled via Cricklewood, South Acton, Acton Lane and over the District Railway between Ravenscourt Park and High Street Kensington. On arrival in platform 4, the locomotive propelled the train up the incline to the shunting neck, at street level. 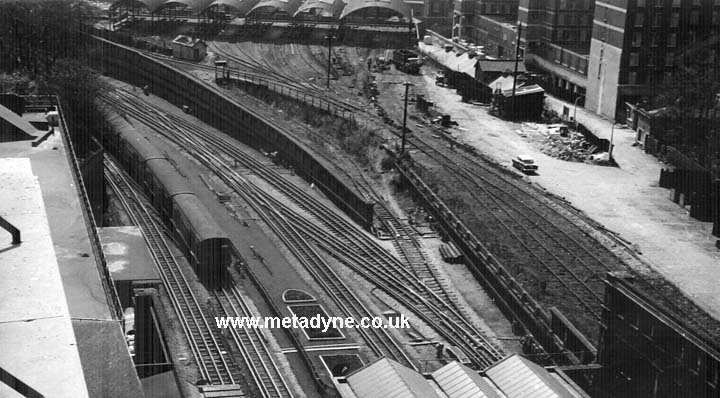 While the incline to the yard had been constructed some years after the District Railway opened, the retaining wall at the end of the platform was already recessed as there had originally been a turntable there. The final timetable shows the final freights timed as arriving at High Street at 09:49 and departing at 14:23, operating on Tuesdays and Thursdays only. There was another train running only ‘as required’ between Mondays-Fridays arriving at 13:22 and departing at 15:23. It was during 1963 that staff shortages began to hit Underground services quite badly, the Metropolitan Line being particularly badly hit (which was rather a pity given its recent modernization and timetable enhancement). The week beginning 25 November 1963 was recorded as particularly bad, the worst day being the 29th when 67 trips were cancelled. Not perhaps a cause of celebration.